Pamp Suisse 1 oz Silver Bullion Bar - 999 fine investment grade silver bullion. 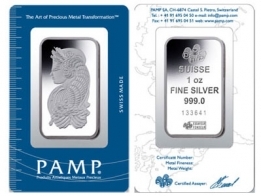 PAMP is one of Switzerland's primary precious metals refineries, and they produce investment grade precious metals bars in gold, silver, platinum, palladium and rhodium. 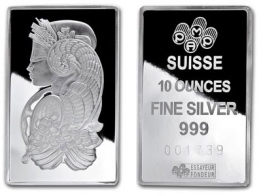 The PAMP Fortuna series of bars was the first series of bars ever produced that featured an artistic design on the front. 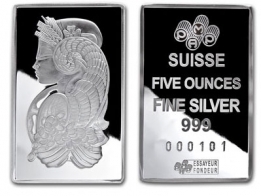 The 1 Ounce PAMP silver bar features an image of Lady Fortuna on the front. The reverse side of the bar features the PAMP logo, with the weight, fineness and serial number of the bar. Each bar comes sealed in a blue certicard, and in an official PAMP box of 25 pieces. The PAMP Fortuna series is the most popular series produced by PAMP. PAMP Fortuna bars are available to investors in gold, silver, platinum and palladium. 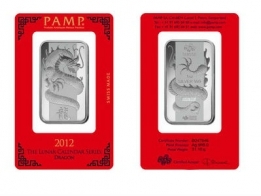 Please contact us to sell PAMP silver bars.